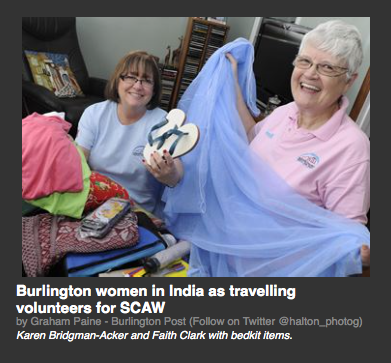 As posted by the Stratford Beacon Herald, January 28, 2015. Hilary Doupe, 11, got a very exciting e-mail recently offering her $1,000. “My mom was looking at it for half an hour to make sure it's true,” Hilary said. It is legitimate and recognizes the efforts of Hilary and her SOAR classmates to do something good. Hilary was selected to go to the We Day event in Toronto in the fall headed up by Free the Children founders Craig and Marc Kielburger. The event is geared toward young people, and the best way to reach young people is through technology and social media. The Me to We movement developed an app called We365 to do just that. Hilary signed on. Through the app, kids are given challenges to complete every day of the year. Hilary's class, comprising gifted students, challenged themselves to raise enough money to buy a goat at Christmas. The idea came from classmate Grace Wideman, 10, who had received a World Vision catalogue in the mail and pitched the idea to her peers. They decided to have a bake sale at Northwestern Secondary School to raise the funds. A goat costs $75. 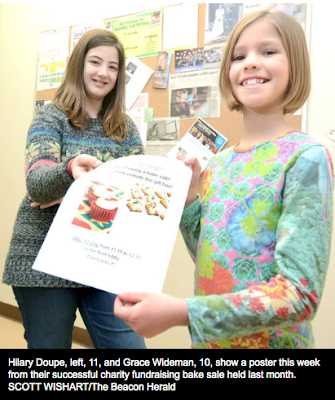 The class raised $339 – a lot of cupcakes and fudge at 50 cents each – and bought four goats. Hilary used the We365 app to post the accomplishment. Later on, while she was at home, a message popped up in her inbox from a name she didn't recognize. “I opened it, even though I'm not supposed to, and started screaming and ran down the stairs,” she said. The e-mail said We365 had chosen her as the winner of the gift of empowerment challenge and wanted to “hook her up with $1,000” to go to the charity of her choice. “You totally wowed us with your awesome post....” said Alexandra Brown, the content and community manager We365. Last week, Hilary and her classmates chose three organizations. The Local Community Food Centre will get $325 for a kids' breakfast program, Sleeping Children Around the World will get $325 and Same World Same Chance will get $350. In addition to the money from We365, the SOAR class has raised enough money to sponsor a SWSC girl for an entire year. In all, they've raised $2,260 since the fall to benefit others. Who knows what they'll do next.